You.Guys. 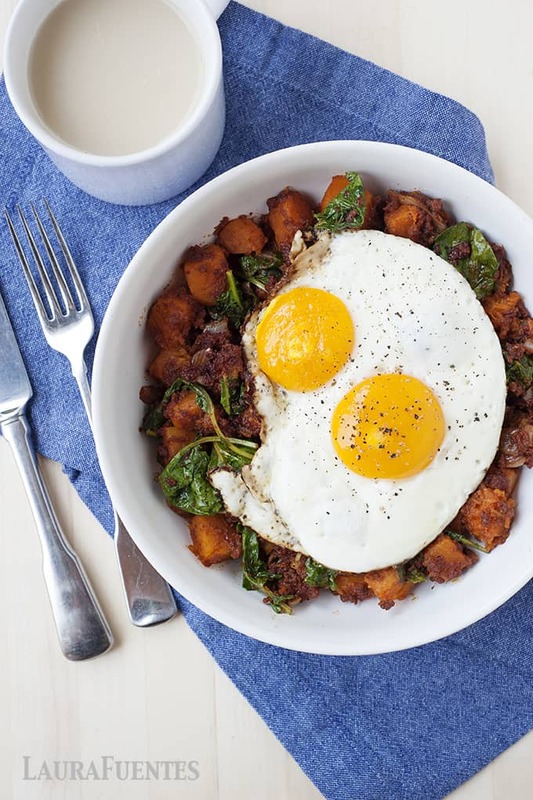 This Butternut Squash and Chorizo Hash recipe is one for the books! The perfect sweet and savory combination in every bite. This recipe IS “in the books,” like literally. It’s inside The Best Homemade Grain-Free Family Meals on the Planet. The other day, I was looking for something to cook with two bags of frozen butternut squash I found in the back of the freezer when this recipe came to mind. I immediately ran to the bookshelf, grabbed the cookbook, and smiled. Aaaahhhh, yes. My beloved recipe was still there. As you can see from the video, it’s a really easy recipe to make, and it’s the perfect budget-friendly meal to add to your weekly plan. While hash recipes are traditionally considered a breakfast option, we usually serve it for dinner, since my kids prefer slightly more traditional breakfast recipes, like pancakes and waffles, for breakfast. 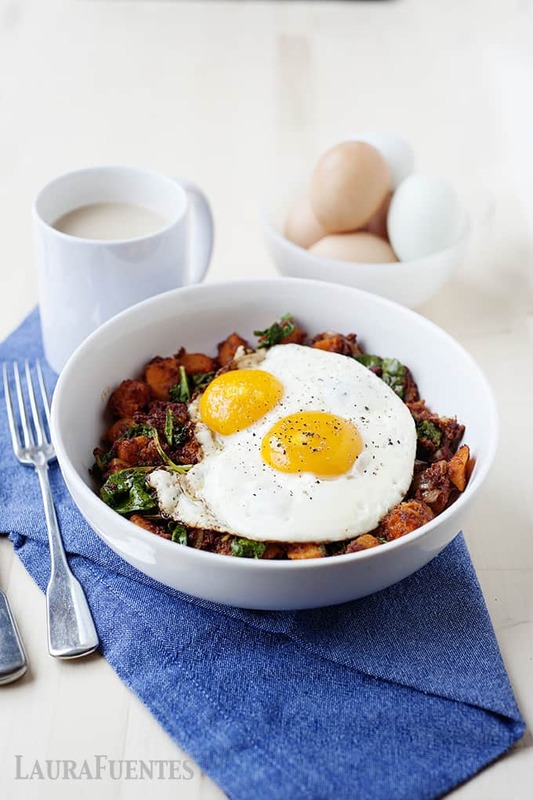 And then, here comes mom with this hash and says “here comes dinner” while I excitedly top each serving of hash with a fried egg. Yes, my friends, when in doubt, add a fried egg to it! If you are still trying to figure out what Chorizo is, you are not alone. I had to explain it to my husband, years ago, when I excitedly showed up with a few links and said: “OMG the store has Chorizo!! !” He clearly didn’t get my enthusiasm since growing up in Spain we used chorizo sausage in many of our dishes. Chorizo is a seasoned sausage that adds a lot of flavor to many recipes. From soups, stews, bean dishes, and more, it brings a depth of smoky, paprika flavor that I love. 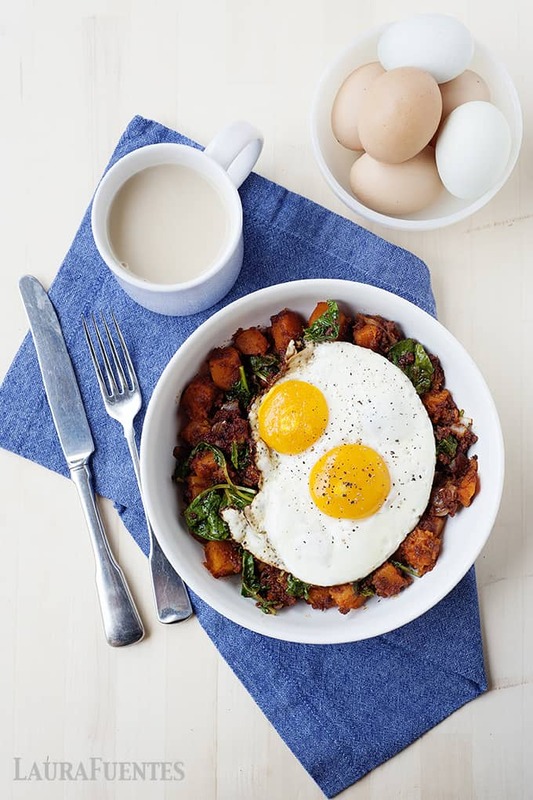 Wanting to switch up my breakfast-for-dinner night a little, I’ve been serving up a few different combinations of “hash” with eggs –very Spanish of me, I know. What I love about using it with sweet potatoes is that it brings down the sweetness and turns the dish into a smoky flavor that gets better and better with each bite. When topped with a fried or over easy egg, the runny yolk takes this meal to a whole other level. You’ve gotta try it! This Recipe comes from The Best Homemade Grain-Free Family Meals on the Planet. Remove chorizo from casing and cook in a large skillet for about four minutes. Remove and set aside; keep the drippings in the pan. Add the onions, and cook, stirring often, for about 3 minutes until golden and soft. Add squash, garlic powder, and cumin to the skillet and continue to cook for 5 minutes. Add the kale and cook until wilted, about 2 minutes. Remove from heat, add lime juice, and season with salt and pepper to taste. Prior to serving, cook eggs on a greased medium pan, to your desired doneness, such as over-easy. Place egg over the hash and serve. Save time by purchasing frozen cubed squash for this recipe. Simply thaw and in-corporate into the recipe. I made this from your cookbook. So happy you finally shared it on your blog. It’s delicious! Made it with sweet potato and butternut squash. so so good! This recipe is the bomb. Made it for lunch today.